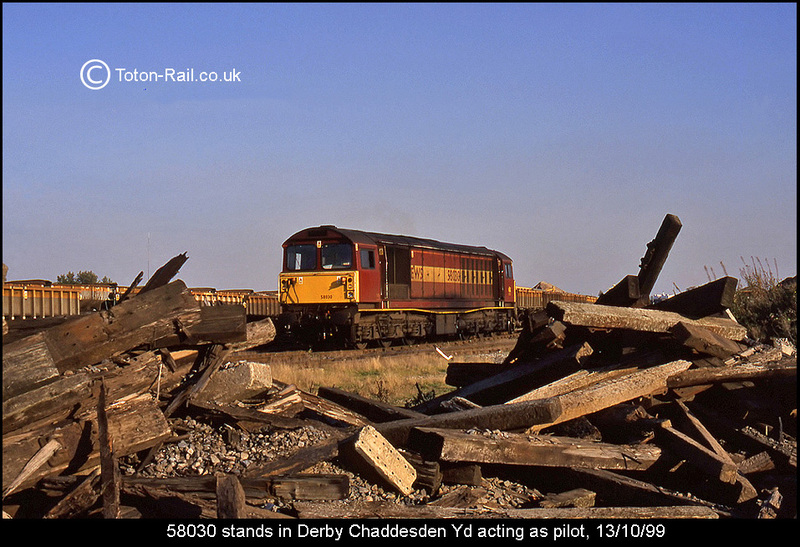 The yard at Chaddesden sidings, just North-east of Derby station was always a fascination to me in my spotting days. 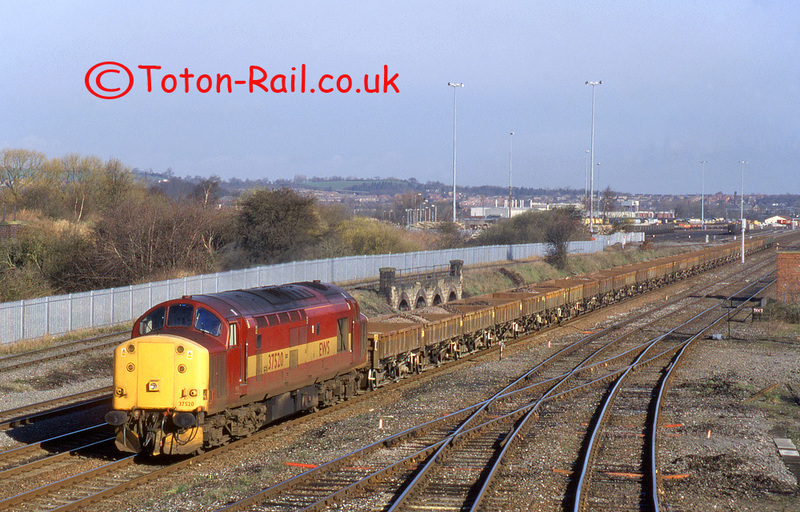 back and forth (prior to the Pride Park link road obliterating the view). 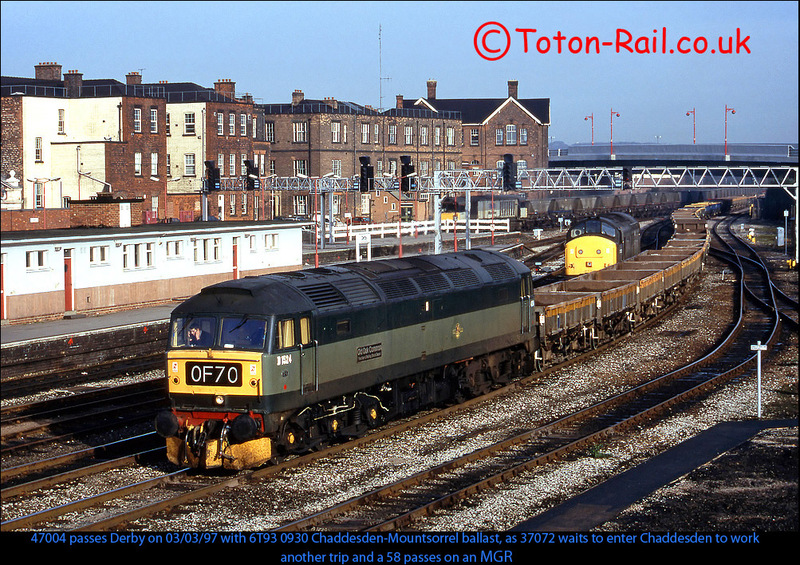 I can recall seeing numerous 20's, paired and single locos, 25's, 31's etc, and even a 50 managed to get to Chaddesden on a spoil train from the West Midlands. 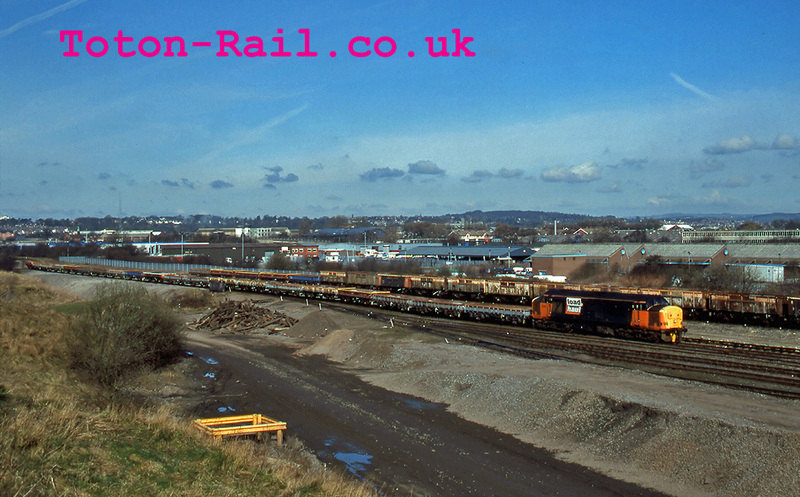 The yards purpose was for the disposal of spent ballast and materials, reclaimed from weekend engineering possessions, which were removed from the wagons by mechanical grabbers which worked on a ridge of ballast adjacent to the southernmost siding, depositing the spoil into large heaps which were then later loaded into lorries for distributing to the crushing facility. 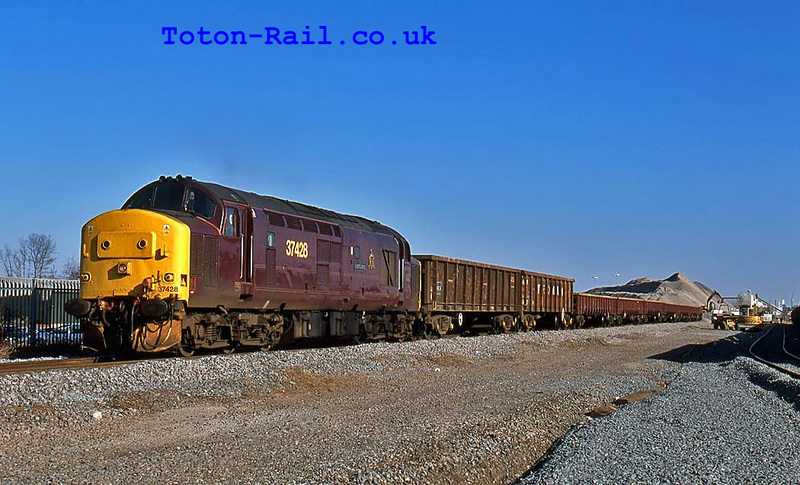 With only this 1 siding being available for the actual removal of the content of the wagons, there was much shunting required to position rakes of wagons for the grabbers to work on. 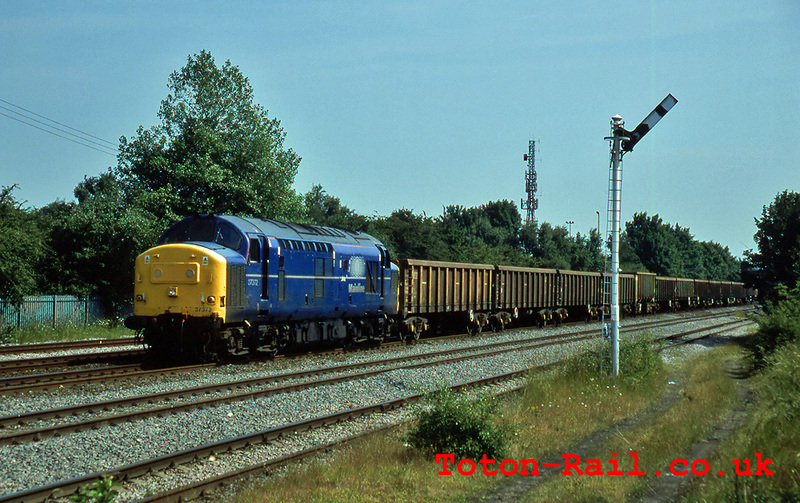 Obviously when the rake was emptied, the pilot loco would shunt these wagons out into an empty road and reposition the next loaded rake for unloading. 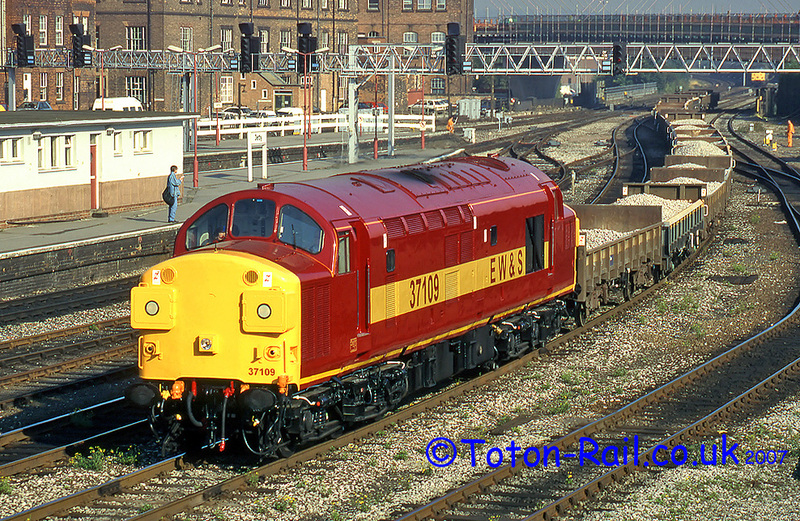 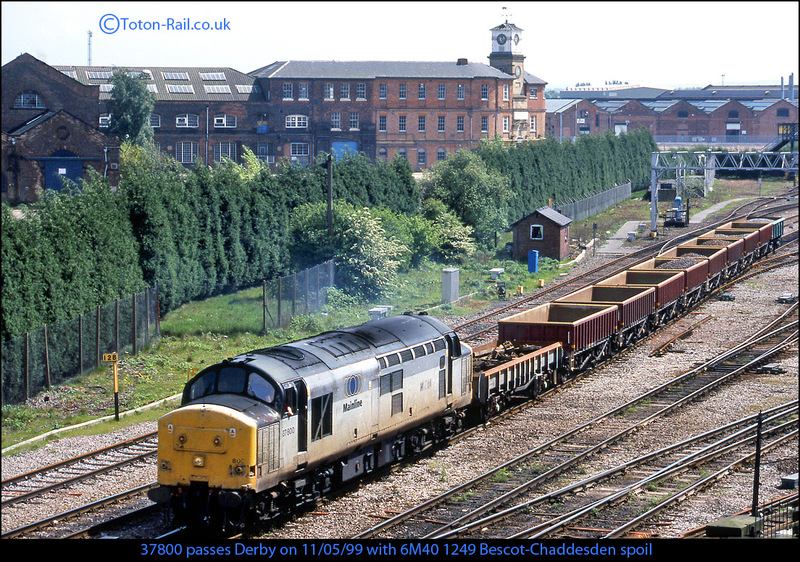 Toton's T89 trip was the dedicated pilot loco for Chaddesden in the 90's, and would often take a rake of loaded spoil from Toton at around 0830, spend the morning shunting the yard, and return to Toton anytime between lunchtime and late afternoon. 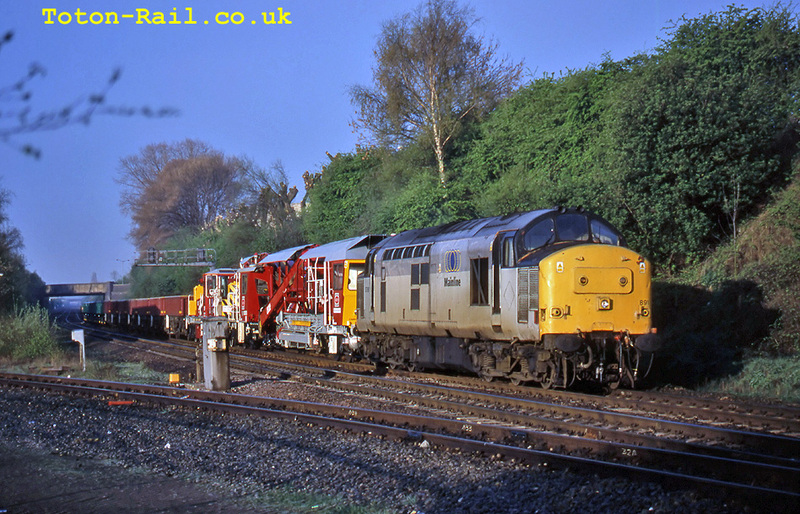 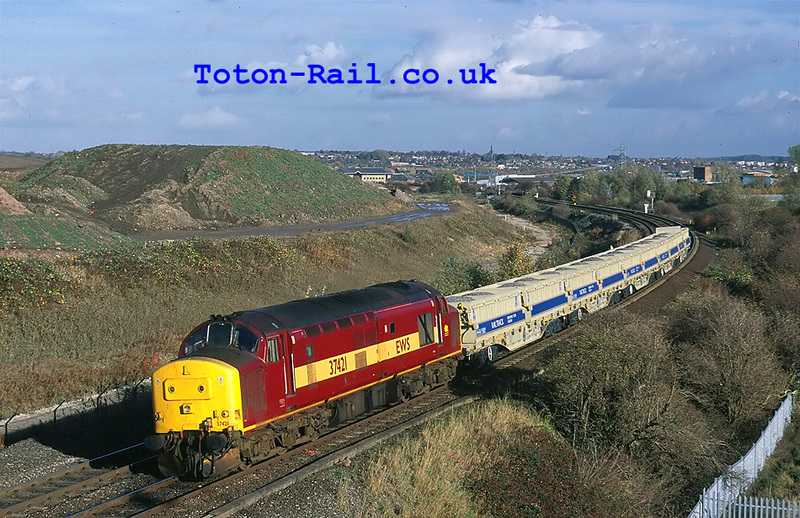 In later years, this trip became known as 6T18 ex Toton, returning as 6T19, and there was also a second path each way 6T20/6T21 which was occasionally utilised in times of high demand. 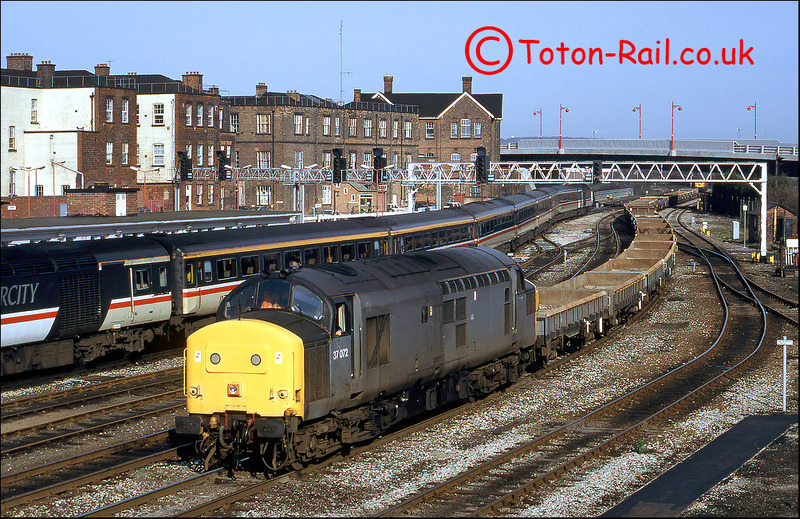 Motive power was usually a class 31 or 37, but in later years it could be anything that Toton had spare, 37's, 47's, 56's, 58's or 60's. 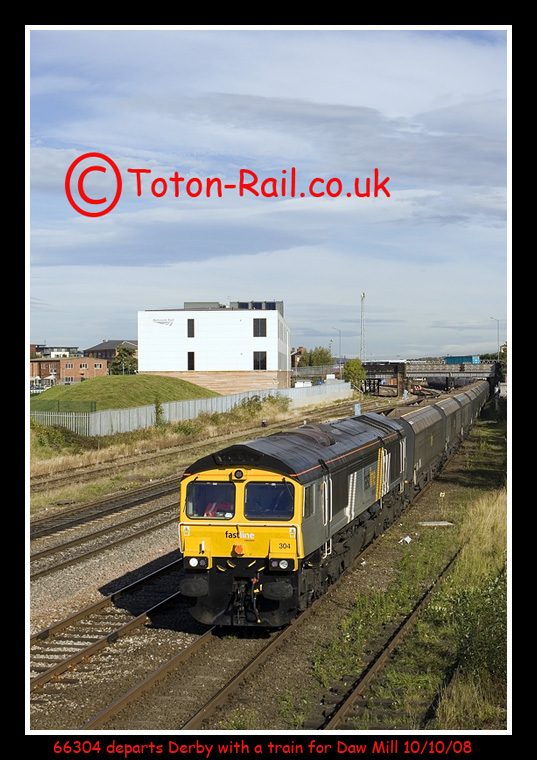 There were also two timetabled paths each way from/to Bescot engineers yard, again for the movement of spoil from the West Midlands area. 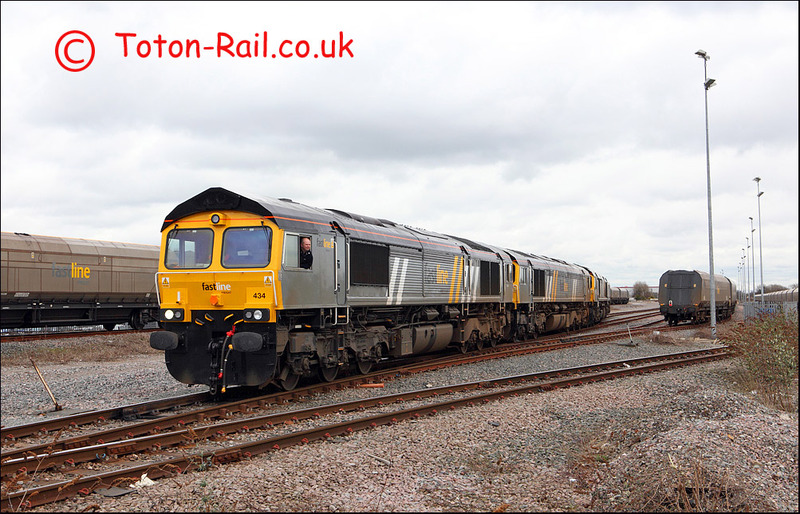 These were an early path ex Bescot at approx 0530, returning around 0930, then a second trip around 1300, returning 1630ish. 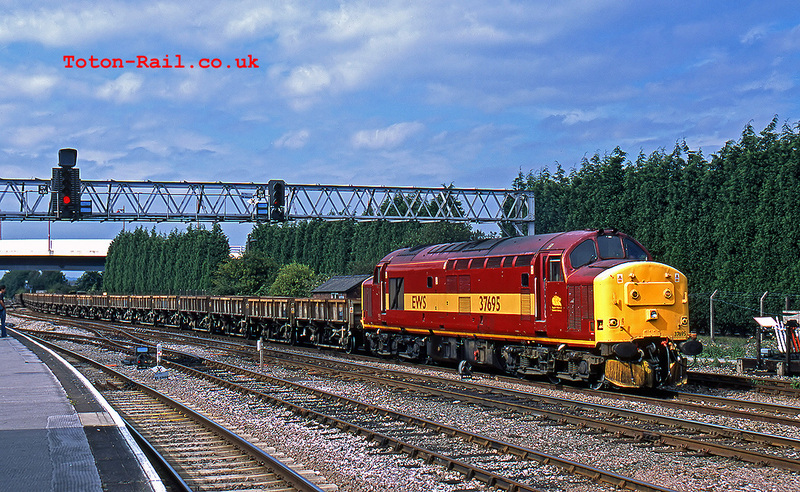 I recall the headcodes in latter years as 6M36/6G38/6M40/6G40. 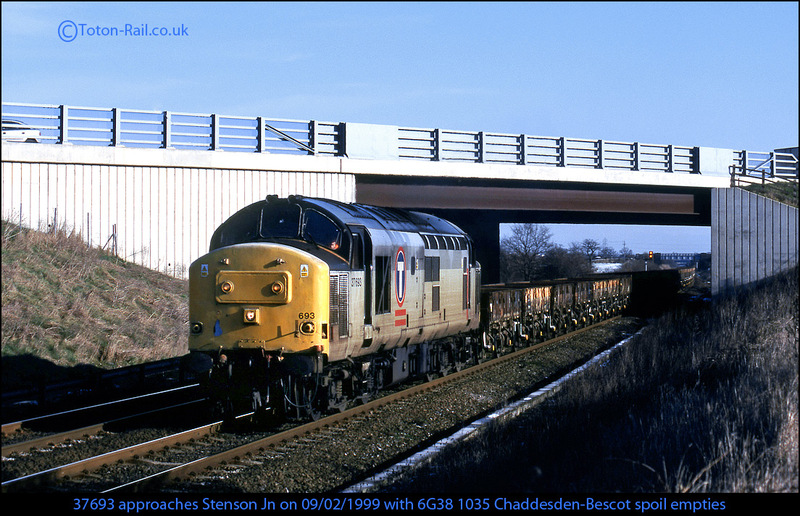 Quite often the loco that worked the morning trip also worked the afternoon trains, so if the weather didn't play ball in the morning, you had a second chance. 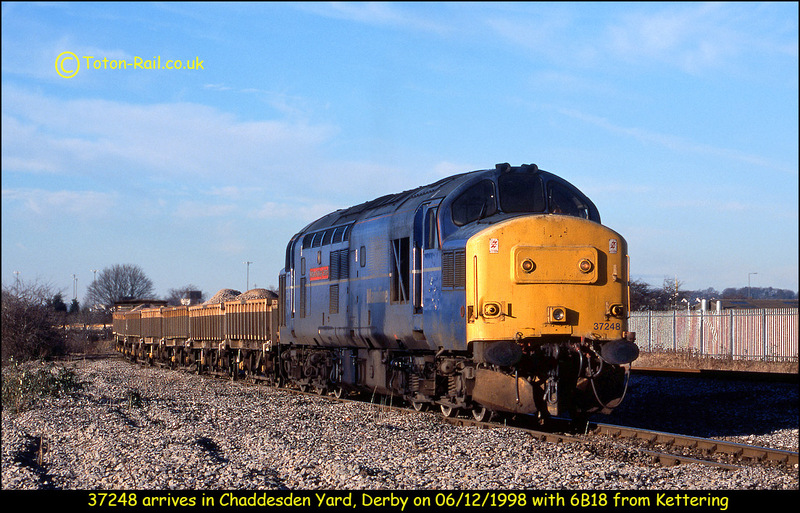 Chaddesden was also used as a stabling facility for weekend possession trains, with either rakes of empty spoil wagons running to possessions for loading with spoil or pre-loaded ballasts, which were usually loaded at Mountsorrel quarry, then stabled at Chaddesden in readiness for the weekend. 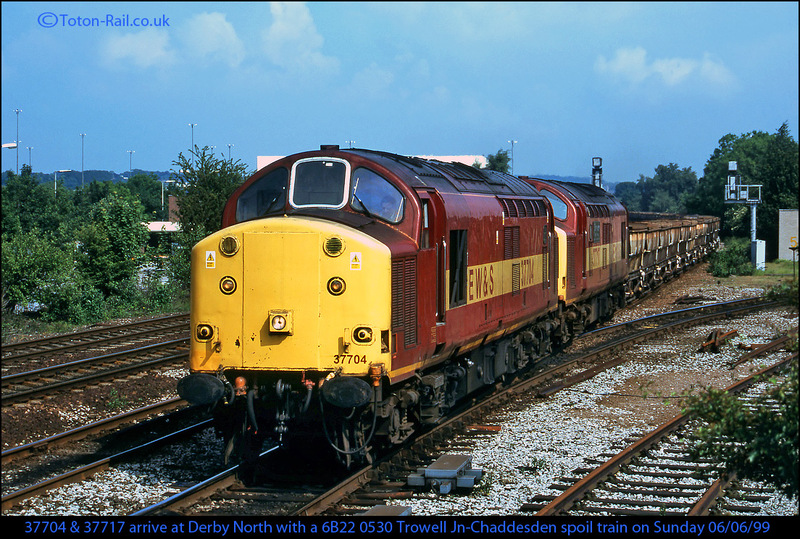 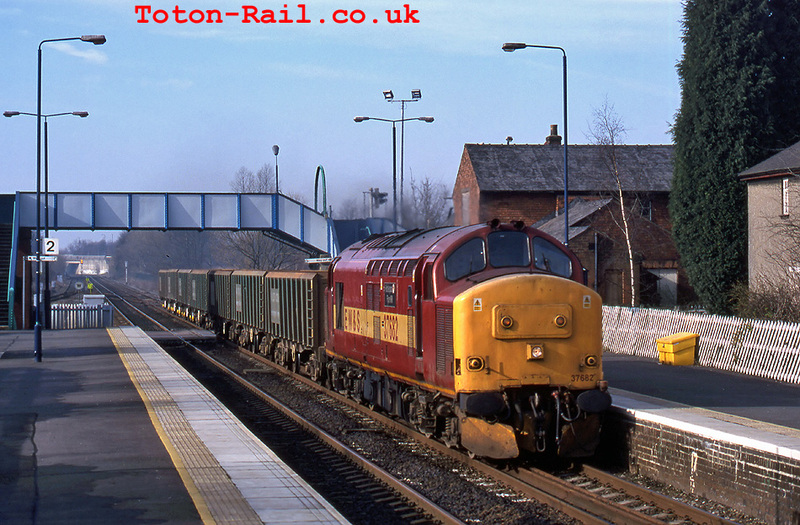 In the early 90's, Toton T91 trip was the regular trip for taking empty wagons from Chaddesden to Mountsorrel for loading, usually leaving Chadd between 0900 & 1000, and returning back to Chadd at lunchtime or early afternoon. 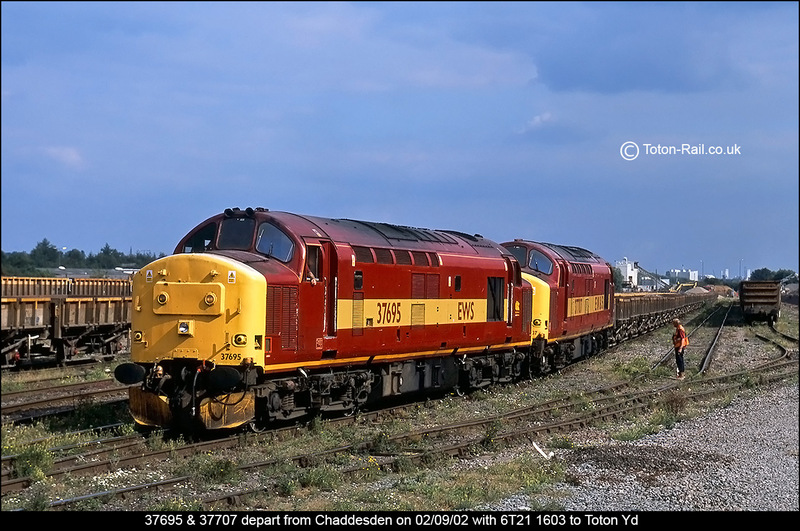 Toton had another 'general purpose' trip, T93 which was utilised as required, sometimes running an extra trip from Chadd to Mountsorrel and return. 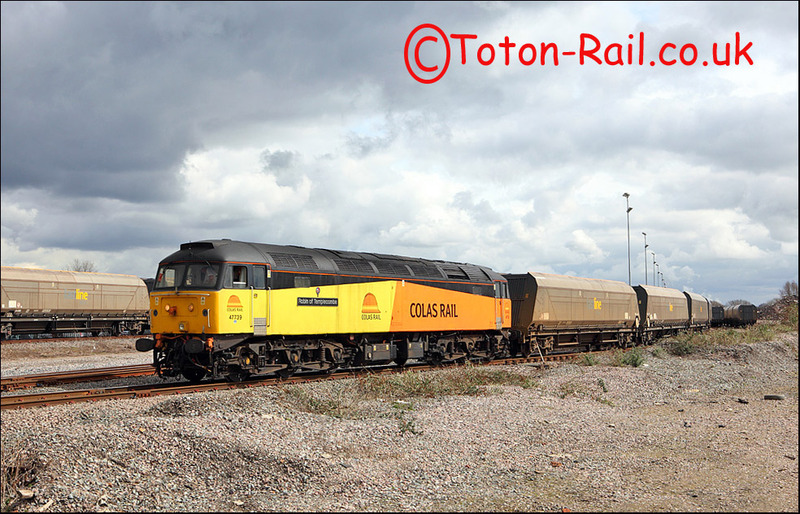 37350/D6700 stands on a rake of wagons on the unloading road waiting to leave as 6G40 to Bescot. 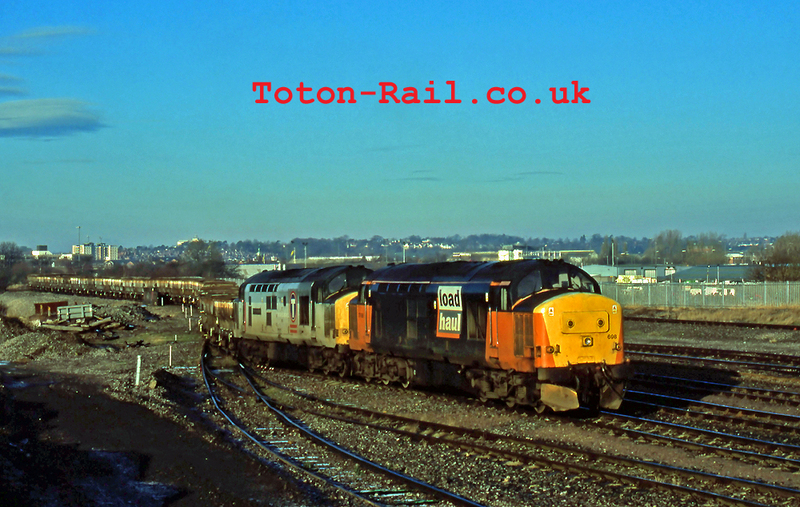 Photography in the yard area was a little hit and miss, as you could often end up hanging around waiting for the pilot loco to perform a shunt. 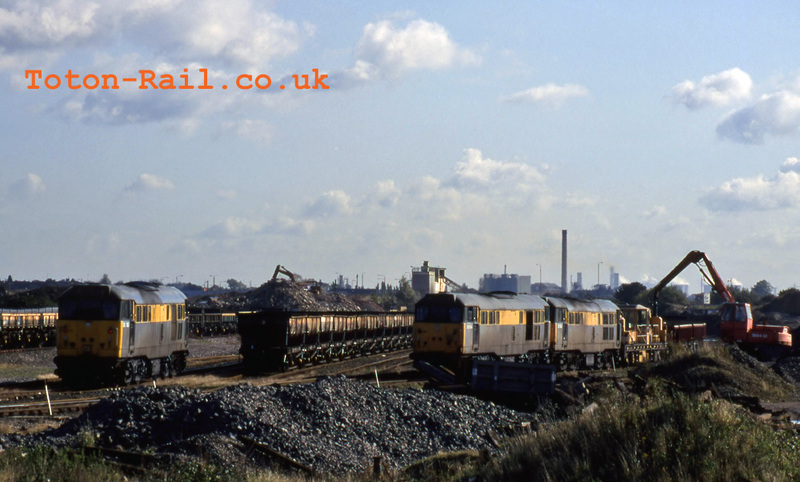 This was often the case if you managed to arrive whilst the grabbers were still unloading a rake of spoil, the pilot would retreat to the bottom of the yard, adjacent to the shunters cabin, where the shunter and traincrew would 'relax' until the grabbers had finished their task and another rake was needed to be shunted into position. 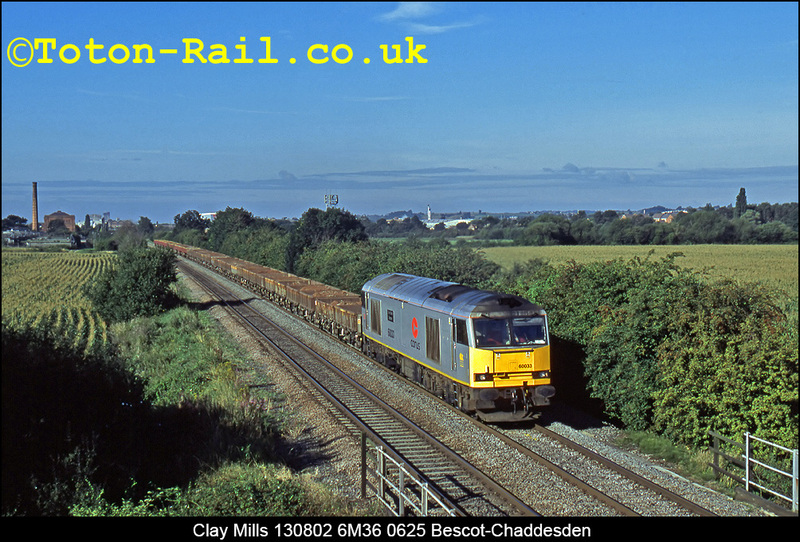 I must pay tribute to the 2 or 3 regular shunters who worked at Chaddesden, without their 'permission' or rather tolerance, photography in the yard wouldn't have been possible. 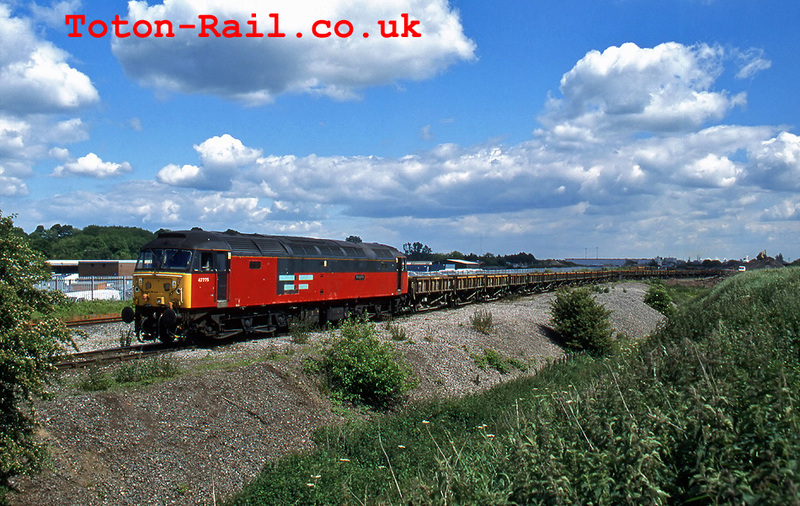 The usual route into the yard is via the path that runs at the side of the cattle market, which leads under the dark and dank tunnel under the head of the sidings which for many years was partly blocked by the burnt out shell of a mini. 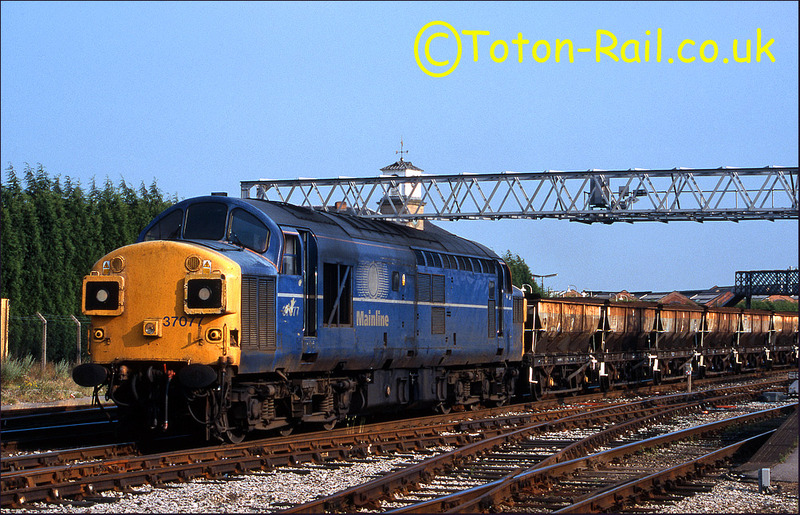 Whoever managed to drive it into the tunnel and get to the far end must have had some bottle as there wasn't much room each side, certainly not enough room for them to have managed to open a door to get out, so I guess they kicked the windscreen out to escape prior to torching it. 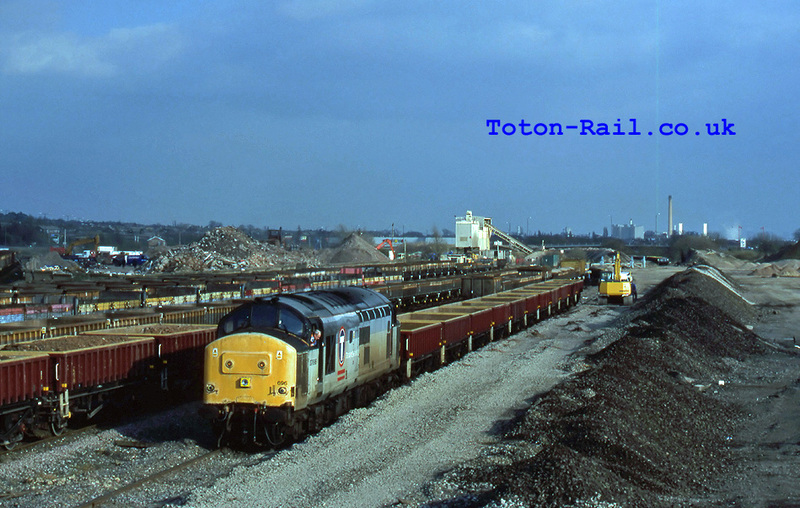 There were a few different shots to do in the yard, there were a couple of embankments that could be scaled to provide some height, as well as the mountains of spoil which grew and receded over time when it was being reprocessed. 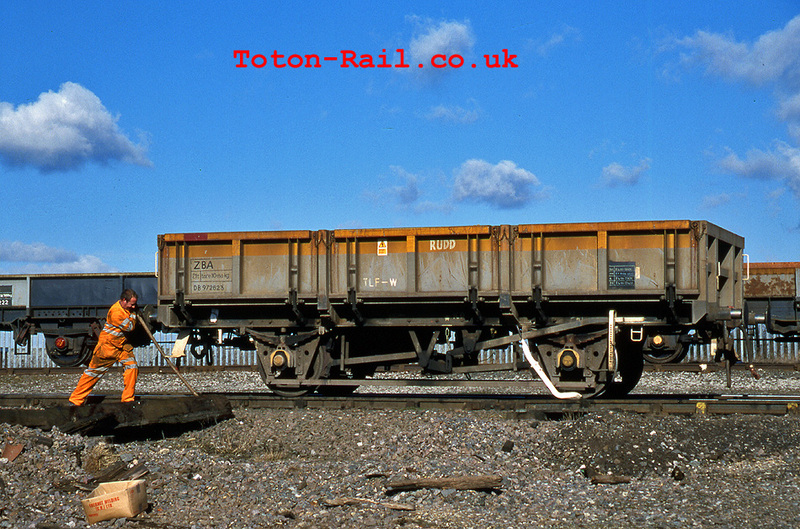 For a long period there was also a wheel-less OBA wagon you could clamber on top of, a remnant of one of the numerous derailments that happened in Chadd due to the poor state of the infrastructure. 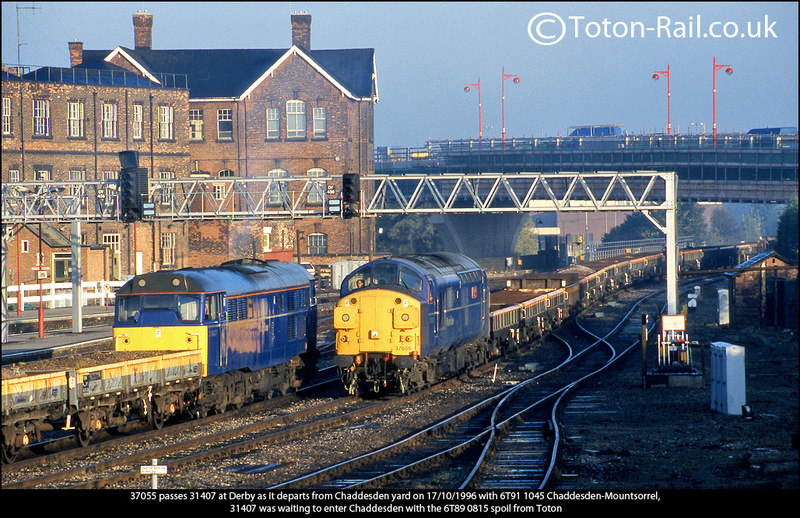 The building of the bridge over the North end of Derby station, linking the city with Pride Park was a welcome addition to the locations available for photographing trains departing Chaddesden, it being an ideal spot for the afternoon departures. 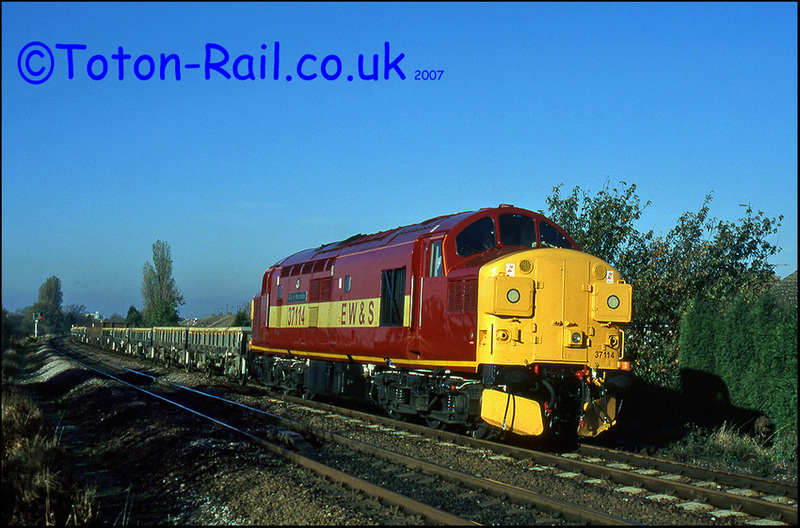 In the late 90's, news spread of EWS's & Railtrack's plan to implement the virtual quarry concept, the East Midlands being served by a VQ at Toton, the West Mids at Bescot. 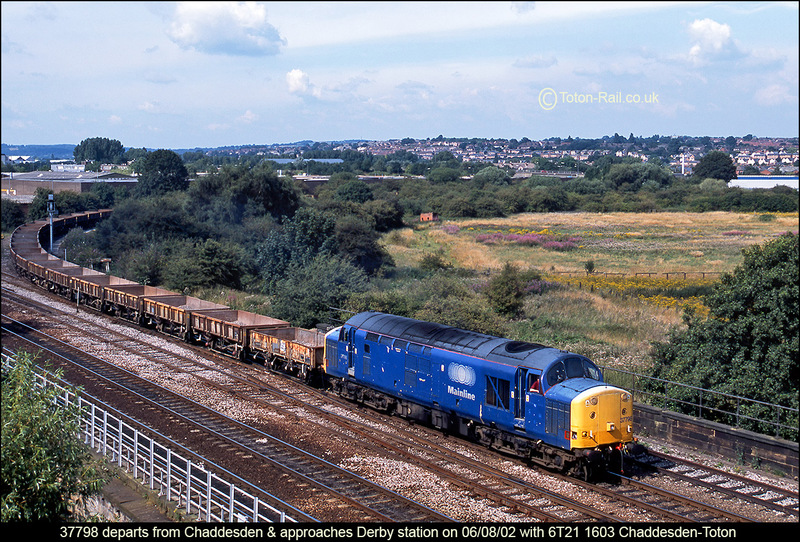 This was what put paid to the outstabling of weekend ballasts at Chadd, and with the news that a spoil recycling facility was also to be built at Toton, the nails were really starting to be hammered into Chaddesden's coffin. 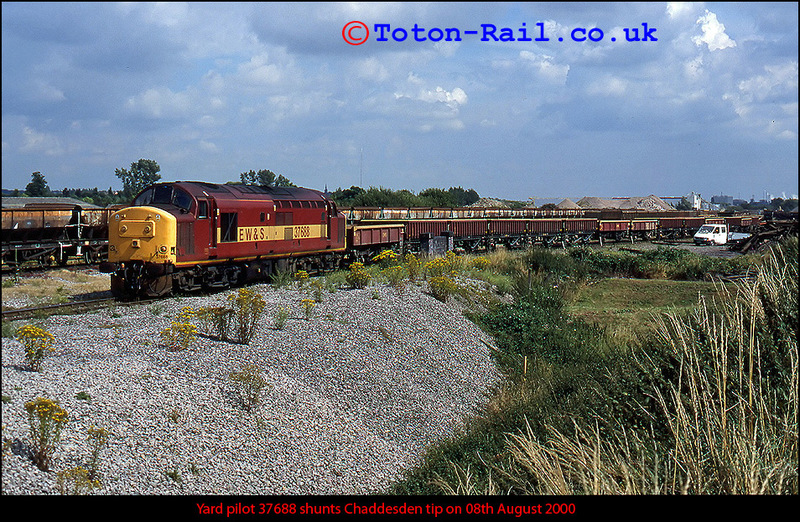 The Toton and Bescot trips fizzled out in 2003, but Chaddesden wasn't quite dead yet. 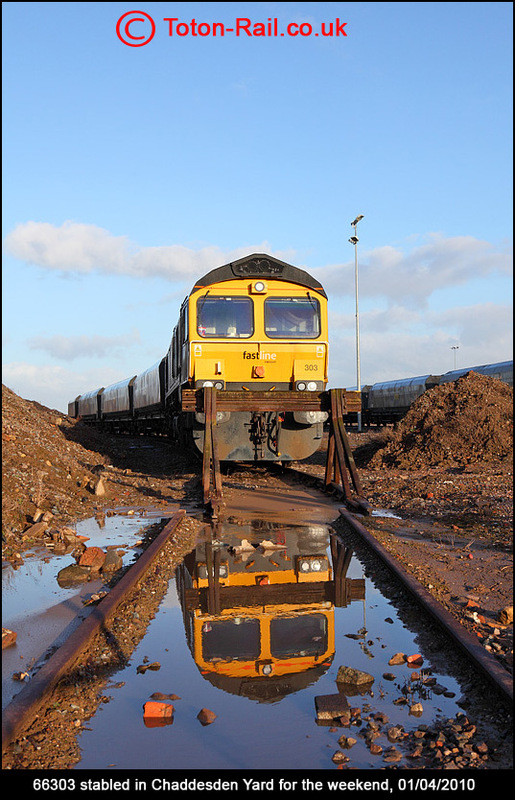 The yard was chosen as the virtual quarry site for the WCML upgrade in the Stafford/Stoke/Crewe area. 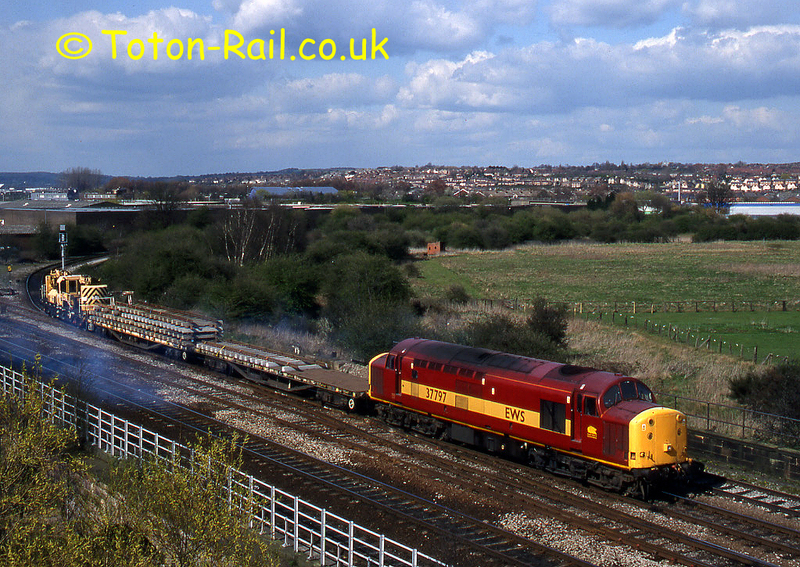 The yard was ripped up and re-laid, with new tower lighting installed. 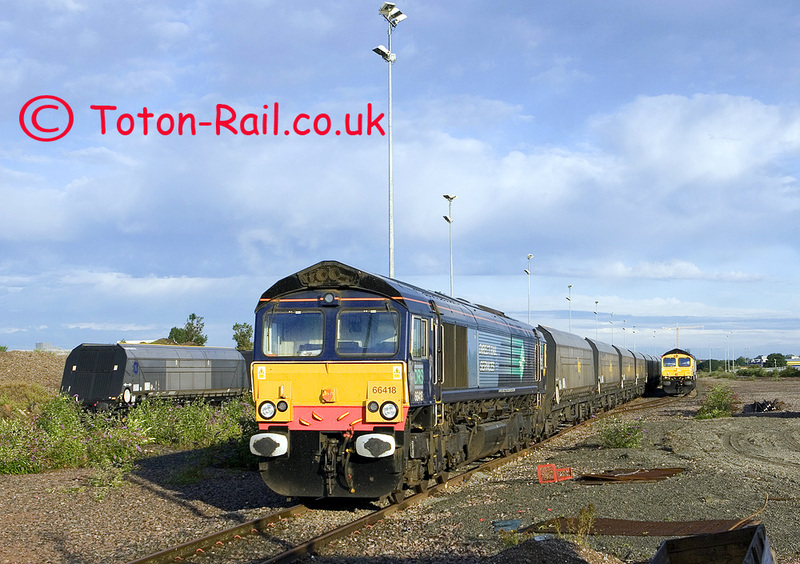 Freightliner Heavyhaul stocked the VQ with ballast brought in from Bardon Hill, and there were a few EWS operated trains too. 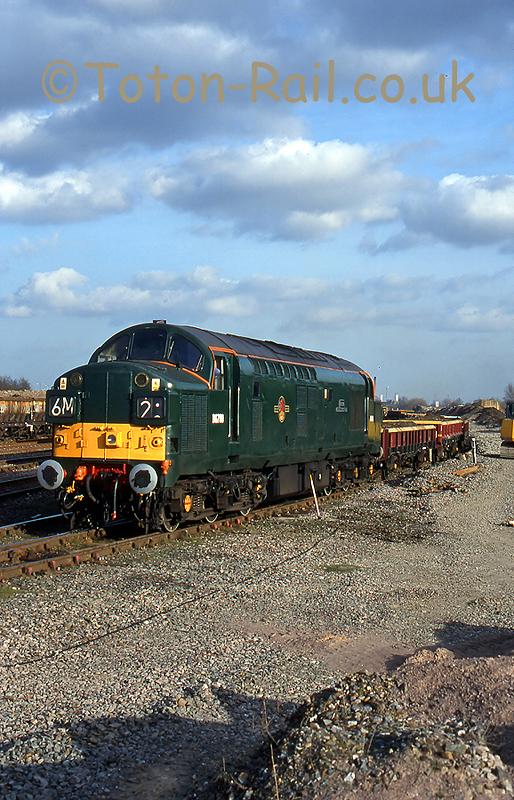 Upon completion of the Stafford-Crewe blockade, the yard again became silent. 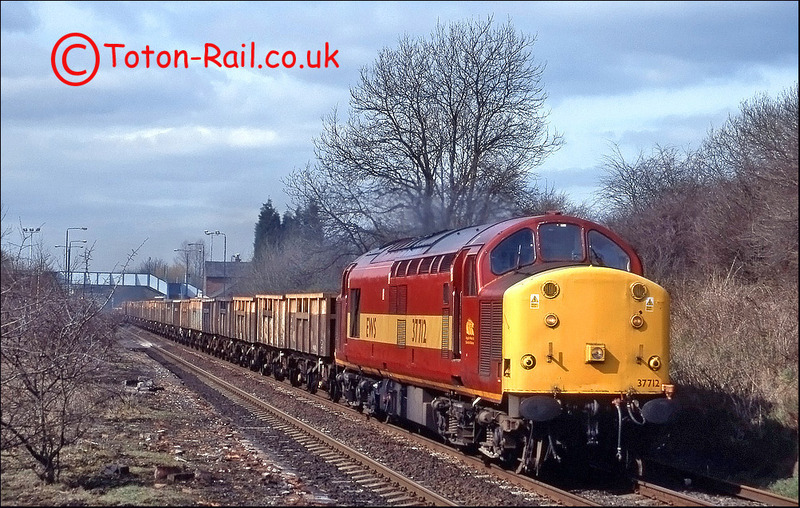 However, in February 2006 FLHH again started running spoil trains from Basford Hall to Chaddesden, due to the spoil heap at Basford Hall being at capacity, but this only lasted a couple of weeks. 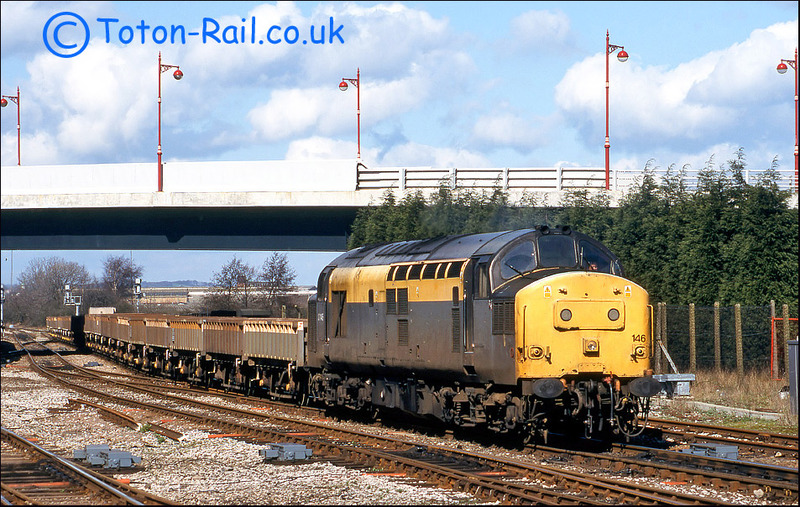 There were also plans to use the site as a stabling and servicing facility for all Network Rail on track plant, but another location near Woodhouse, South Yorkshire was favoured for this but it doesn't seem to have happened yet. 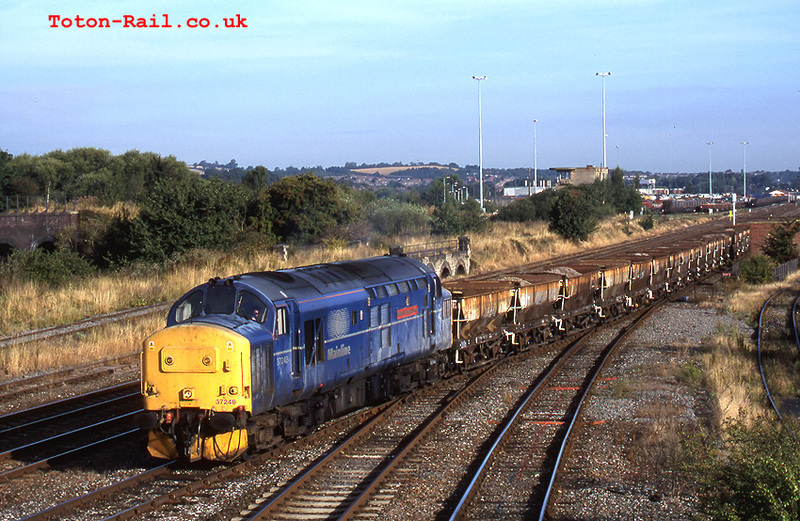 Fastline Freight, a subsidiary of Jarvis, began running coal trains to Ratcliffe power station in 2008 and based their leased locos and wagons at Chaddesden, which was not an ideal situation as not all of the sidings could accommodate whole trains of 21 wagons so a lot of shunting and splitting of trains had to occur at weekends. 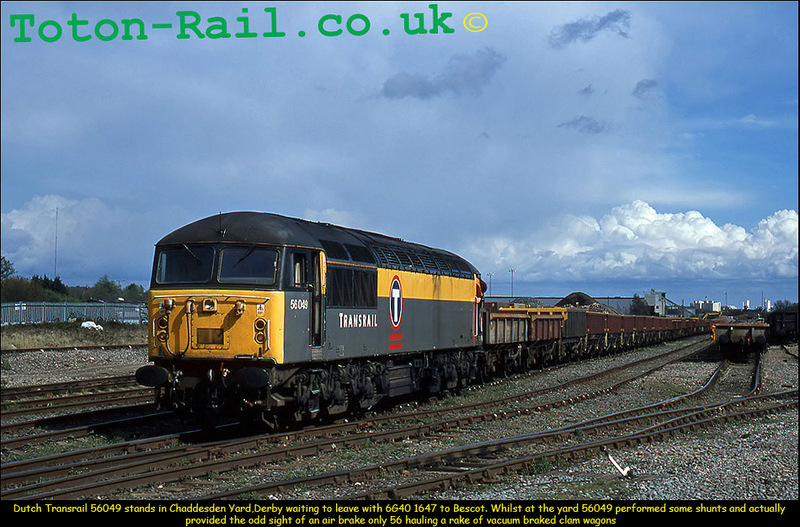 Unfortunately the Fastline Freight FOC was put into administration along with the rest of Jarvis in March 2010, and the locos and wagons were removed from Chaddesden for the last time during April 2010. 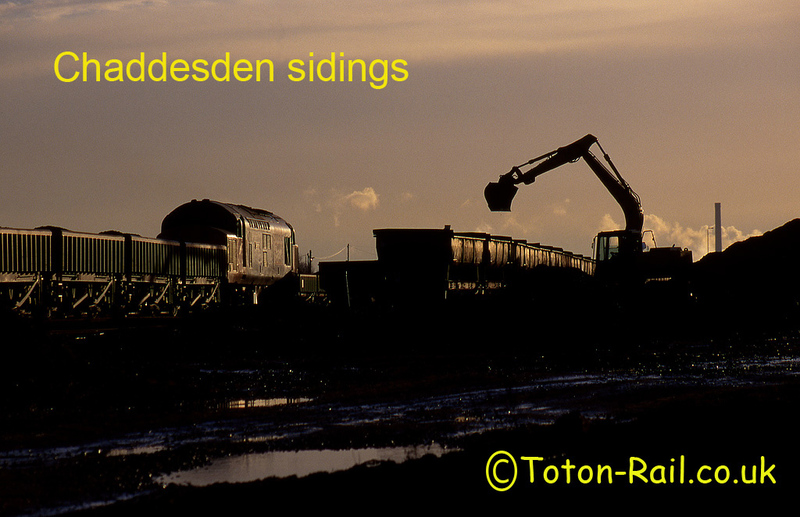 Chaddesden is used to stable the 7 car Loram rail grinder trains, and DCR also use the sidings. 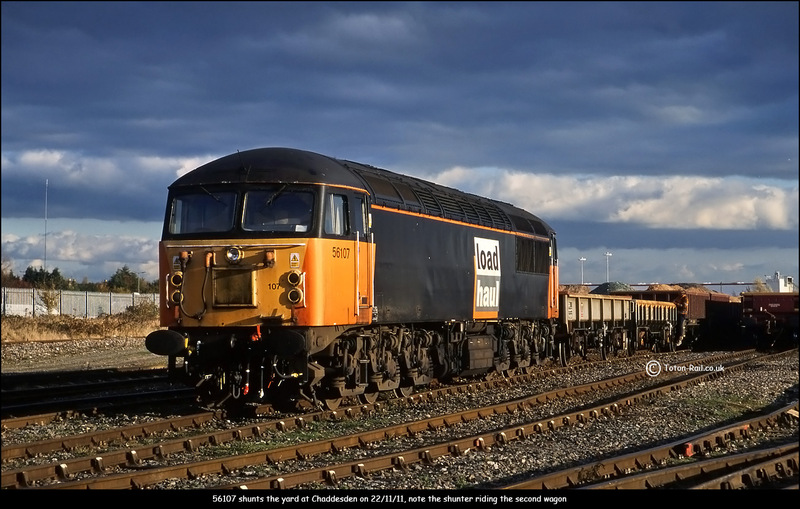 DBS had also inquired into using a siding here for the loading of scrap trains but this seems to have gone quiet. 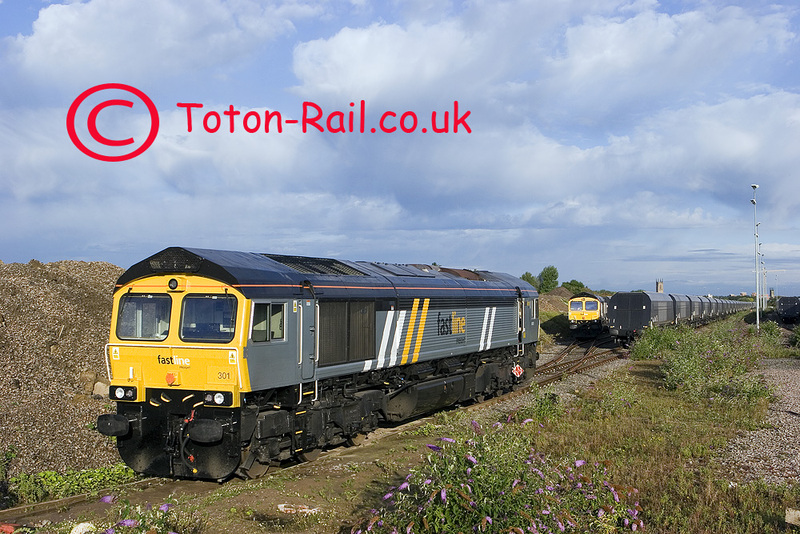 The site also now has a large Network Rail Pway & S&T depot built on the site, this has seen the outside (most Northerly) road being curtailed. 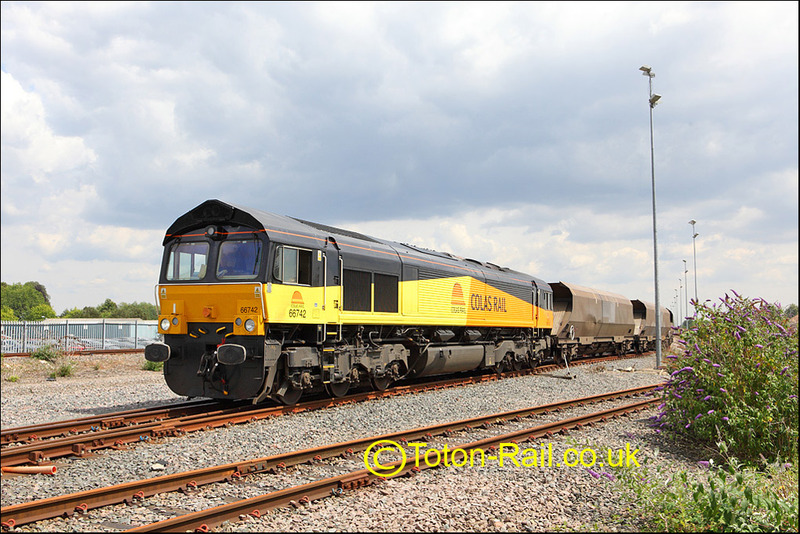 With Chaddesden having a quiter life at the moment traffic wise, and with the decline in coal traffic from Spring 2015 due to a new Government coal tax, Freightliner have stabled 40 or so wagons here pending them being required again in the Autumn.